Newsletter N° 8/2010 - Combi-packer CM: three functions for one machine! three functions for one machine! While consumer preferences rapidly change, Food&Beverage companies look for innovative packaging solutions with a particular focus on flexibility. In fact, the significant increase in the variety of products launched on the market requires as many high quality, visually appealing packages. Looking to better serve their customers, packaging professionals must devise top-of-the-line solutions in terms of efficiency and operational versatility, while keeping an eye on costs. Such objectives can be achieved only choosing flexible systems, designed to handle different products and to switch quickly from one format to the other. Food&Beverage companies can now keep the pace with new market trends thanks to the fully-automated packaging systems featured by Smi combi-packers. Smiflexi CM series combines indeed in one machine the functions of a wrap-around packer, of a tray-packer and of a shrink-wrapper and can process a wide range of containers running up to 80 packs/minute. Smiflexi CM stands out as a smart alternative to several machines, conveniently realizing with a single system high-quality packs in film-only, tray+film, pad+film, tray-only, closed or semi-closed boxes. When the working schedule calls for packs in tray-only or wrap-around case, the thermo-shrinking tunnel and the film-wrapping module are automatically excluded from the main control system. 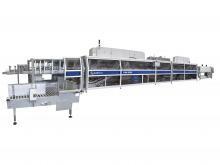 Quick and easy changeovers make Smiflexi CM series particularly suitable for bottling lines processing a wide array of containers and packaging patterns; combi-packers configuration can also be adjusted so as to add any new formats the rapidly changing market might demand. If your company is looking for a flexible, cost-cutting and space-saving packaging solution, please contact our Sales Department and learn more about the new Smiflexi CM series.